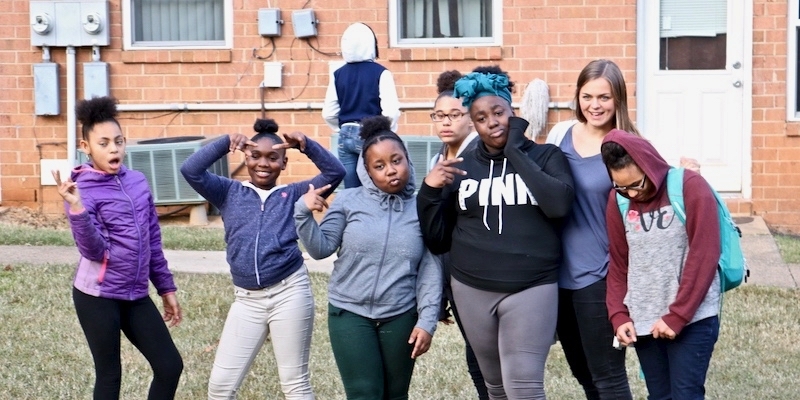 For two months, in partnership with Light House Studio, eleven young ladies from Abundant Life’s female empowerment group Royal Girls worked on creating a film that highlighted the positive aspects of living in Greenstone on 5th apartments. Upset that there were so many negative connotations about their place of residence within the Charlottesville area, they sought to bring attention to the positivity surrounding them. “Spreading Prospectivity” takes a deeper look into the minds of our youth on what it means to be an encouraging force in their communities, and to the people they cross paths with, in their everyday lives. During the filmmaking process, the participants worked hands-on as producers, directors, interviewers, and editors. Working both in front of the camera and behind it proved difficult, but Royal Girls were up for the challenge. To express their feelings about their community as a whole, the girls wrote an original poem featured at the beginning of their film. “Spreading Prospectivity” proved to be a platform for the young women to bring their artistic expression, perspectives, and visions that allows the world to see what they see: positivity in the Prospect community. To celebrate its completion, Royal Girls premiered the 8-minute film on November 29 at Vinegar Hill Theatre. Surrounded by their parents, community leaders, and Abundant Life staff and board members, the girls were equally nervous and excited to share the finished product. At the conclusion of the film, the girls participated in a Q&A session with the audience. When asked what they learned, 5th grader Saria Spencer explained how good it felt “to get out and talk to people.” On her experience making the film, 6th grader Mercedez Gray stated, “It was good because we put our everything into it. We did everything we could to make it successful.” Following the Q&A, the audience warmly applauded and thanked Royal Girls for their film. You may watch “Spreading Prospectivity” below. Next Mentor Spotlight: Jerry Maynard, Jr.